Quinn Wellers is proud of having risen to the rank of sous chef at a trendy Los Angeles restaurant by the age of twenty-nine, but otherwise her life seems to have been leached of color since the death of her sister Beth in a single-car automobile accident two years ago. Quinn moves through her days in a routine that requires no risk and little thought. That changes one day when a Harry Potter lookalike in her favorite coffeeshop turns out to be a lawyer who delivers the news that Quinn is adopted and that her birth mother has left her an inheritance in Wildstone, California. Quinn is stunned by the information and reluctant to believe it. Her parents’ confirmation of the lawyer’s claims leaves her angry with her parents for keeping the truth from her and uncertain about how the revelation affects her identity and her relationships, including her sense of connection to Beth, who was not her biological sister. Quinn leaves for Wildstone, still so distraught that she has a panic attack upon arrival. There she discovers that her inheritance includes half interest in a house and a decidedly untrendy café and potential guardianship of a fifteen-year-old sister, Tilly, who is filled with anger and grief over the loss of her mother and convinced that Quinn is just one more person who will leave her. Quinn’s life is in Los Angeles—her parents, her friends, and her career. Small-town Wildstone is the antithesis of all she has ever known. Nevertheless, she decides to remain in Wildstone temporarily because “she’d already lost one sister to tragedy. She didn’t want to lose another to cowardice.” She discovers the appeal of the town’s quirky characters who hope she will reopen her mother’s café, the hunky Mick Hennessey whose own life is in San Francisco but whose ties to Wildstone cannot be denied, and Quinn’s personal ghost—her sister Beth who assures Quinn that their bond of sisterhood is forever, even as she campaigns for Quinn’s presence in Wildstone. Quinn must decide not only where she will live but also who she is, what direction her life will take, and how to build a relationship with the smart, secretive, needy Tilly. Lost and Found Sisters is Jill Shalvis’s first venture into women’s fiction, and fans of her contemporary romance fiction will be pleased that it contains this popular author’s usual snark, humor, and skillfully drawn characters who demand the reader’s emotional investment. However, the heroine’s journey rather than romance is the center of this novel. Quinn’s sense of self is threatened not only by learning that she is adopted but also by feeling that she was thrown away by her birth mother. She must come to terms with her adoptive parents’ deception and her biological parents’ choices, and also with Beth’s loss and Tilly’s presence. Mick has some family issues of his own, but, despite the plans of an ex-girlfriend who would like to eradicate the ex in their relationship, he is ideal hero material, capable of killing monster bugs and exposing corruption in local government, of helping with Tilly and ending Quinn’s loneliness in and out of bed. Although I loved the characters in this book, it fell short of five stars for me because there is so much going on that the story’s tapestry seemed tangled at times. In addition to the primary plot, Shalvis weaves in threads concerning Quinn’s former boyfriend/current friend, Mick’s best friend’s substance abuse and love life, and Tilly’s first love, an abused teen. Although all these story lines make for rich potential for other books in the series (This one is billed as Wildstone #1), they blur the focus on the central story. Regardless, I finished the book with an understanding of Quinn, confidence in her future with Tilly and Mick, and an eagerness to read more of Shalvis’s Wildstone-set women’s fiction. If you are a Shalvis fan, you will want to add this one to your collection. If you are a fan of small-town contemporary romance, I recommend it with the caveat that you remember it is more a hybrid of two genres than strictly women’s fiction or romance. She's my favorite contemporary author! Interesting analysis! Thanks, Janga. I want to read it now! A lot going on, but life is like that at times. Thanks for this review. It does sound like a wonderful story. I enjoy reading small town stories. This should be right up my alley. 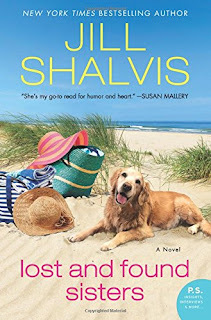 I love Jill Shalvis' contemporary romance books and I was wondering if this book was going to be as good as those. I'm waiting for the library to have a copy ready for me to check out so I can read it. Thanks so much for your review.